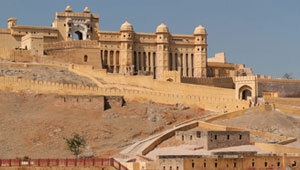 You will be picked up by our driver and drive to pink city Jaipur,the capital of Rajasthan. You reach around 11:am. Your Private tour guide meet you in Jaipur and first you visit famous Amber fort and after amber fort you visit Water palace. Lunch Time: Enjoy the Rajasthani Meals. After lunch you visit wind palace , city palace and local markets. After Jaipur sight-seen you drive back to new Delhi and reach late night in new Delhi.